We fled war to find safety with our families. Why is the E.U. making our lives more miserable? 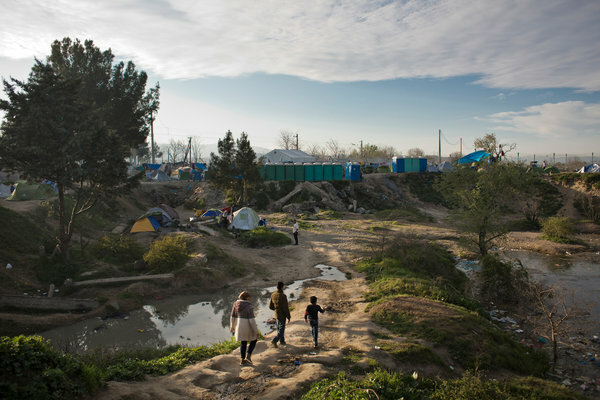 IDOMENI, Greece — WHEN we first got here we had money to buy a little food. Now it’s gone. We stand in line for hours for a sandwich. My husband told a journalist recently: “People are fed up. Maybe tomorrow they will break down the gate and flood across the border.” The journalist said, “How many weapons do you have?” If we knew how to carry weapons or wanted to carry weapons we would not have fled Syria. We want peace. We are sick of Killing. 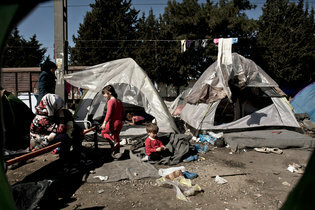 We fled a war, and now the European Union is making war against us, a psychological war. When we hear rumors that we’ll be let into Europe, we celebrate. These leaders give us new hope, then they extinguish it. Why did you open the door to refugees? Why did you welcome people? If they had stopped it before, we would not have come. We would not have risked death, me and my children, and thousands of others, to make the crossing. I’m 39 and Kurdish, from the city of Hasakah. I knew from watching the news that Hasakah was under threat from the Islamic State. Every day last spring, the government would shell the city’s outskirts. Sometimes a stray shell would land near us. One day, at 5 in the morning, we heard the shelling and we knew that the Islamic State had arrived. I took my children and two bags and fled. In those days, everyone had two bags ready at all times: one containing important documents and the other clothes and other essentials. We ran through a dry riverbed. It was still muddy and we sank in up to our ankles. If you have a son in Hasakah today he has to go to war. It doesn’t matter if he’s your only son or if he’s studying. If there’s no boy, a girl has to go. Someone from every house has to fight if you want to stay in the area. The Kurdish forces tried to conscript my daughter. I had to smuggle her out to Turkey. Most of my family is in Germany, and so we decided to go there. 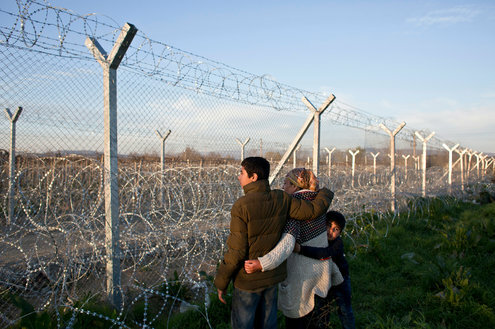 We spent two months in a border area before fleeing to Turkey, where my husband was working. We found a smuggler through Facebook — a relative by marriage — and flew to Izmir. Two days later, we stood in the dark with 35 others somewhere on the Turkish coast. We were the last people on the beach, my daughter, her husband, their baby and me. My daughter was sobbing. She said she didn’t want to go and that if she died, the guilt was around my neck. I didn’t know what to do. Then, like a dream, a young man came and lifted her and the baby into the boat. It was just me on the shore. I waded out to the boat. The smugglers lifted me from below, and my nephew pulled me up. The day we arrived here in Idomeni people were still crossing the border into Macedonia. We thought we had arrived. We thought the hard part was the sea. I have three sisters and three brothers in Germany. The European Union wants to keep us divided between countries. If we sign up for the relocation program and the European Union assigns us a European country and we get that citizenship, will we be able to go to our family in Germany? I’m afraid they will change the laws and we won’t be able to go even then. In our own country we refused to be separated. Are we going to agree here? Everyone in Idomeni just wants to go to their families; otherwise they would not have undertaken this dangerous journey to be reunited with them. In the next tent, there are two women who haven’t seen their husbands in two years. The men are in Germany and haven’t been able to bring their wives and children. I want all the leaders in Europe to hear me: If any one of them agrees to be separated from his son, I agree to do the same. Or his brother, or his sister, or his cousin. If they want to do this to us, let them give us back what we lost to come here, and send us back to Syria. If I wanted to live among strangers I would have applied to go to Canada. If you’re sick, who will help you? You need your brother, your sister, your mother, your father. Laila is a licensed hairdresser. She asked that her surname be withheld because she fears telling her story could endanger her family in Syria or affect her asylum claim. As told to Laura Dean, a journalist based in Cairo.